Reporter David Karp in his recent article in the New York Times, Our New Global Garden (3/14/18), cites statistics from the United States Department of Agriculture (U.S.D.A) Economic Research Service, which demonstrate the steady rise in the import of fruits and vegetables grown in other countries. The latest information from the U.S.D.A. shows that from 1975 to 2016, the percentage of total U.S. sales of fresh fruit and vegetables from other countries has risen from approximately 22% to 53% for fruit, and from approximately 5% to 32% for vegetables. Bananas, limes, mangoes and pineapples top the list of fruits and vegetables, which at 99.9%, represent the highest percentage of fresh produce grown outside the United States. But it should also be noted that in 2017, avocados surpassed bananas as the most valuable fruit based on monetary value imported into the United State. Avocados have been described recently as the fruit of global trade with more than 1.7 billion pounds of Haas avocados exported to the U.S. from Mexico’s Michoacan State (upland from the beaches of Acapulco). 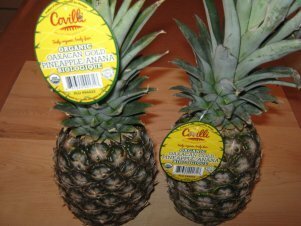 To an older American with a memory of enjoying Hawaiian pineapple as a child, it’s startling to discover that Hawaii no longer grows the delicious fruit for the American market. 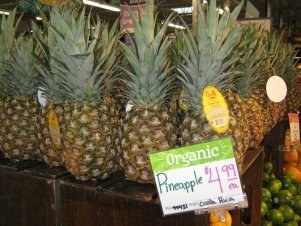 Last year, reporter Brittany Lyte in an article in the Washington Post, With pineapple and sugar production gone, Hawaii weighs its agricultural future (12/17/17), noted that in 1980, Hawaii hosted 14 sugar and four pineapple plantations that farmed more than 300,000 acres. In 2017, these two crops accounted for less than 5,000 acres. Once the largest pineapple plantation in the world, the island of Lanai’s former crop beds were now parched and deserted. Reporter Lyte quotes Alika Atay, a Maui County Councilman: There’s no reason why we should go to a grocery store and see a banana from Ecuador or Mexico. We can grow banana here. . . Why do we go to the store and see mango from Chile, not mango from Maui, when Maui grows some of the sweetest-tasting mango in the world? On an island chain that once was completely self-sufficient — before the arrival of Westerners in the late 1700s, indigenous Hawaiians thrived 2,500 miles from the nearest continent using sustainable farming and fishing methods — the article in the Washington Post sounds a positive note that many Hawaiians believe a resurgence of local agriculture is possible. 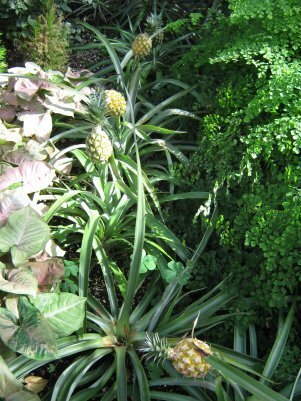 With this accelerating globalization of agriculture in mind, it was a surprise to see pineapples growing in Providence, Rhode Island on a recent visit to a wonderful indoor garden, the Roger Williams Park Botanical Center, New England’s largest indoor garden. Especially with spring weather in the northeast delayed in arriving this year, touring 12,000 square feet of indoor gardens in the Botanical Center’s two main greenhouses over Easter weekend was spirit raising. In recent years, the cold storage of apples, has resulted in local, organic apples available nearly year-round. And organic frozen berries are a year-round part of every day consumption; in particular, this consumer stocks up on fresh organic Cape Cod cranberries which are frozen for later use. In a marketplace blindly saturated with products that have been brought to us by the use of unfair and discreditable labor practices, we now have a chance to CHOOSE & BE FAIR. Integrity and equitability have always been part of Covilli’s core values and acquiring the Fair Trade certification was only natural. In a nutshell: Being certified confirms that the farm workers of Covilli have safe working conditions, access to healthcare and education for workers’ children; regulated hours as well as personal and sick days. Fair Trade also verifies sustainable farming practices. 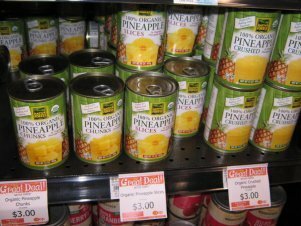 The canned pineapple sold by the Albany, NY food co-op in its grocery aisle is also organic, Native Forest 100% Organic Pineapple in organic pineapple juice. Native Forest is a trademark of Edward & Sons, described as A Family Owned Vegetarian Company since 1978. Shown on the cans of pineapple as a product of Vietnam, there is no reference to fair trade either on the can or on the website of Edward & Sons Trading Co., Inc. Nonetheless, the label on the can does note: Organic certification assures you of sustainable farming practices which nourish soil, protect biodiversity and provide a premium to farmers. Edible: An Illustrated Guide to the World’s Food Plants, published in 2008 by the National Geographic Society, and a worthy addition to any home library, notes that pineapple is native to Brazil and Paraguay and the first people to relish the fruit were the Tupi-Guarani Indians. By the end of the 16th century, the Portuguese and Spanish introduced pineapples to India, China and Indonesia and the west coast of Africa. Although favoring seasonal, local fruits, indulging in organic, fair-traded pineapple is an occasional treat for this 21st century citizen of the United States.